Liquid castile so very versatile and can be used for almost everything. You will see that I reference it in many homemade, all natural products for cleaning. Hence, I thought it wise to share how to make it. For different uses you will need different dilutions of soap to water, but here is the fastest and best way to make it quickly. You can dilute with more or less water as needed for other purposes. 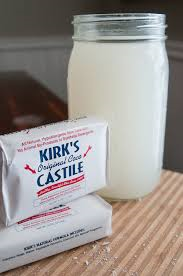 While waiting for water to boil chop up your bar of castile soap or grate it. It will be very easy to do since it is very soft. Put the chopped up/grated soap bar (yes all of it) into the mason jar. When the water has come to a gentle boil pour into the mason jar over the soap. Put lid on Mason Jar and let sit. It will natural melt because this soap is oil based. Should take 10-20 minutes. If some stubborn chunks remain at the bottom after 10 minutes, simply stir a bit. All DONE! Now you have your liquid castile soap base for making cleaning products for the home. Will be posting more ways to use around the home and for yourself as time permits and updating this page for other ways of making for various purposes as time permits.